The DSTT is no longer an area devoid of communications. In case you haven’t noticed, there’s now a somewhat suspicious-sounding but completely legitimate “Tunnel WiFi” available at all five DSTT stations (but not in the tubes between stations). Launched by King County on March 9, it was promoted so riders could start planning for route changes. King County will continue to maintain it after ST turns on cell coverage but is not planned to be extended in to the tubes. The plan is still to have the cell service up and running in the tunnels and stations from UW to downtown by the end of this summer, then in the DSTT this fall and in the Beacon Hill station and tunnels early next year. WOOT! Alright Sound Transit! You see, Sound Transit is the Seattle Seahawks of transit! Not quite. 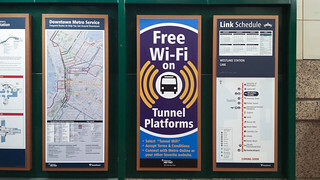 The current, right-now-can-use WiFI in DSTT “Tunnel WiFi” is coming from, wait for it … the hated by Lazarus … Metro KC. Regarding cell service, ST here is more like the 2010 Seattle Seahawks, rather than the 2013 Seattle Seahawks. Aspirational. The Tunnel WiFI is nice. Much stronger and faster than the Starbucks version. While it disappears between the center of the tunnels, it picks right up again. Keep on change fumbling guys, I’ve got a movie to download. Unfortunately, right after Convention, it disappears. Right, it says “Launched by King County on March 9” in the post. My pet peeve is the stupid “click to accept the terms and connect” button you have to deal with each time. I know practically everyone uses them, but are they really necessary, and do they really provide much legal benefit? It would be so much better is your device just connected and started working without that nonsense!